The Band’s chat was interesting, such as the tale of how they were invited to perform at a house-concert, which turned out to be in a squat where wooden furniture was being burned to keep people warm. And the tale of the song Ruthy wrote about her second pregnancy, saying how she was excused from doing anything she didn’t want to do, entitled Simple And Sober. Other songs included New York City Is The Town Where I Found You; The Farmer; Legends Only Appear In Black And White; Vincent 1952 (? )(Richard Thompson); Goldeneye. The concert was neatly rounded off with On The Way Home, with the brass section joining in. The earlier support act was good listening, Gill Landry (guitar, mouthorgan) and Matt Parke (pedal steel guitar) doing sad love songs and songs of Americans who felt disaffected by their lives. I especially liked what the Sage technicians were doing with the lights, pretty disco effects for some of the songs, and a screen with the USA stars and stripes on the stage. 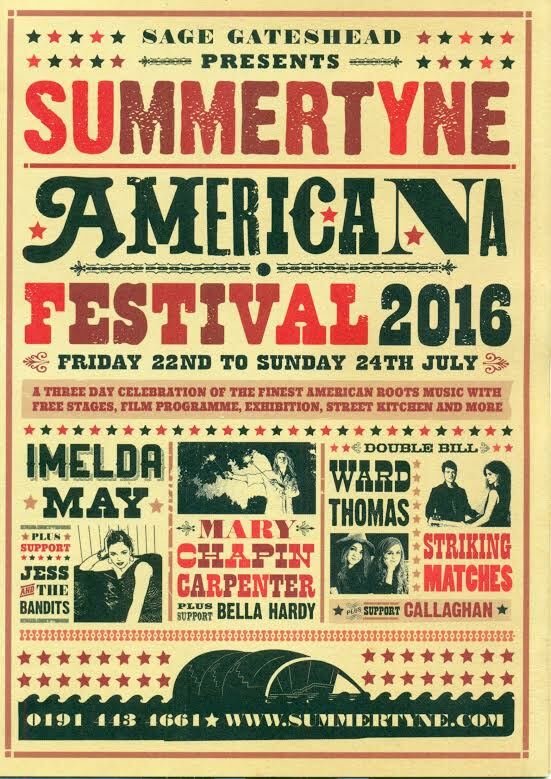 I see that Imelda May performs at the festival tomorrow, that should be good. Just a thought: Is she related to Theresa May, and should she be appointed as the next PM? And I wonder if Theresa May can sing? Yes, I’m completely sober whilst making these reflections, you wouldn’t want to know what I think about while I’m drunk, unless it’s to imagine Russell dressed as a cowboy! Sober? I'll be the judge of that!